I’m sorry to say that I have yet to start that beautiful pattern that I won and talked about last week. I originally planned to go shopping for yarn this past weekend. But, the weather was incredibly beautiful, and I realized that I wanted to be outside, and not shopping, even if it was for yarn. Instead I have been spending bits of time here and there knitting a scarf I started for Emma several months ago. I love this yarn and have done a few different projects with it. 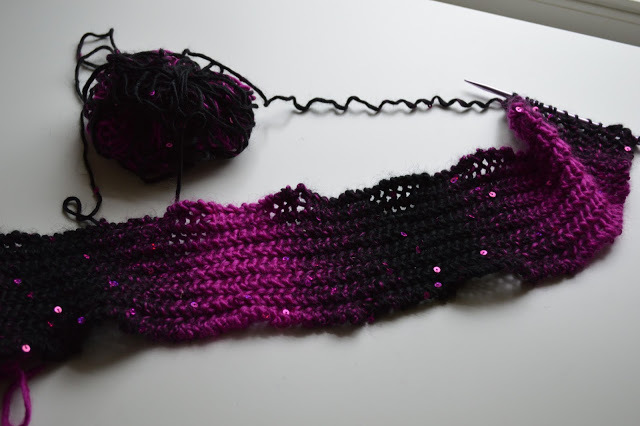 I love the sparkly sequins, and I love the black and deep pink colors together. My book reading is still in the homeschooling realm. I received a box of books from Amazon on Monday. There is nothing better than a new box of books in the mail! It is my favorite kind of mail actually. 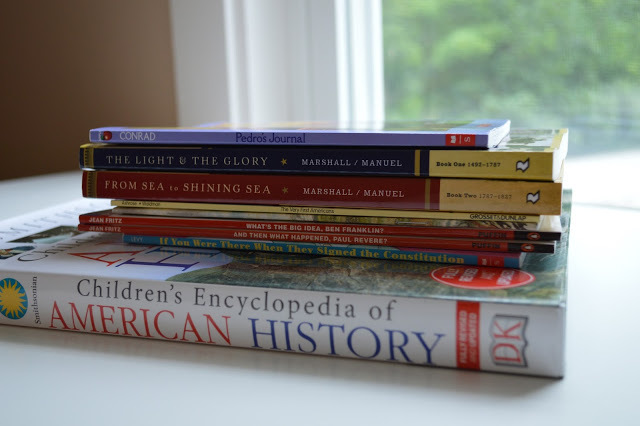 These are going to be the main books that we use for our journey into early American history this year, and I am incredibly excited about it! I still have A LOT of books to buy, but for now, I am working my way through these and trying to set up some lesson plans for the new year, which will be starting before we know it – how does that happen!? 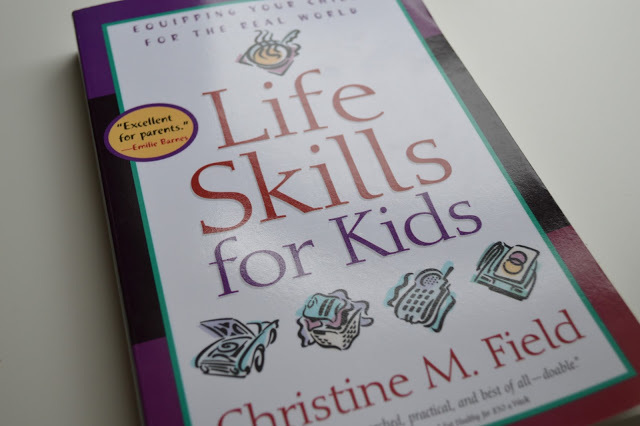 The other book that I recently got and am incredibly excited to get into is Life Skills for Kids: Equipping Your Child for the Real World. I think that we are doing a good job at preparing our kids, but I honestly feel like I am at a loss as to how to teach them different life skills, so this book should come in handy. I have seen it highly recommended. I am only on the introduction, so there is a long ways to go before I can come to any sort of opinion on the book, but I am hopeful! 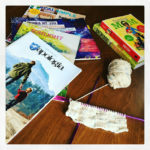 Looking at your stash of Homeschool books take me back to long ago when I homeschooled – I used to love planning the new year and getting excited about all the new books, new subject matter etc. maybe you will start next week?? I am in between knitting projects and I love dreaming about the maybes. Good luck! 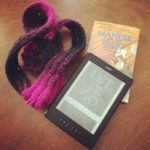 Oh yes, yarn and books make the best kind of mail! I will have to look for that Life Skills book at the library. We've had such rainy crappy weather that you'd think I would be getting a lot of knitting done, but I've gotten a lot of nothing done. Beautiful scarf. I love that yarn. I love boxes of books too. I'm with you……a box of books in the mail is some kind of wonderful!!! I've had my mind wrapped around lesson plans for fall, too! LOVE receiving books in the mail!! Life Skills for Kids is excellent! The pink and black together are very pretty! 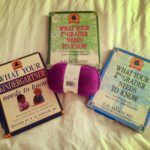 I am working hard on not planning next year but I suppose I need to carve out time to think and plan our first homeschooling year although I plan to be very simple for kindergarten. Still, there are some supplies to gather! Books from Amazon- one of my favorites! I've been reading for the upcoming school year, too. I just finished Paper Towns by John Green. Now I need to start the books that my district is mandating. It must be so much fun to design your own curriculum. I completely understand Heather, the yarn will still be in the store, enjoy beautiful days when they present themselves. You do have some gorgeous yarn you are using for you scarf. Yes, a box of box in the mail is always great. Can I let you in on a little secret? I have never knit socks with sock yarn. 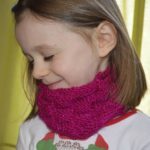 I always use worsted and larger needles – of course I haven’t knit socks for anyone but my kids either, and the thicker socks seem to work best for them. Well, I cast on a new project. Socks, with the tiniest strand of yarn I could possibly find…The stitches are tiny! It took me a good 45 minutes to get the 5 rows you see in the picture completed. 45 minutes. I am a slow knitter, but that is extremely slow! I hope that as time goes on it moves a little faster though, or else I will end up with one sock completed and the other never to see the needles. These are not adult socks either, these are for Emma. The pattern is called “Socks for Little Witches.” I am not sure where I found the pattern, but the picture of the finished project looks adorable, and something I think Emma will love…if I finish them! I might need to pick a back-up project. My reading is the same as last week. I haven’t had as much time to read the past couple of weeks, besides reading to the kids for school. I am almost finished with the John C. Maxwell book, and we are still reading Harry Potter and the Sorcerer’s Stone. I am also re-reading Pride and Prejudice for the 100th time. I read it to Lucy before her naps, seems to do the trick of putting her right to sleep! looks like expert sock knitting to me! lovely color of yarn 🙂 I re read wuthering heights like you re read p&p. I love that you're reading an adult book for nap purposes! I used to do that with my first, not for naps but because i needed it, and he just wanted to lissten to my voice. They are tiny and seem to take forever, but they are ridiculously satisfying!! Love the colour! I have never made worsted weight socks but I haven't made many sock yarn socks either – I haven't been much of a sock knitter. I have a pair with sock yarn going right now but they took a back burner to a few more urgent projects… plus they are slow! But faster, though, after the first few rows I think. I love P&P and have read it a couple times. I'm now listening to Sense and Sensibility and really enjoying the humor in a way I might have missed as a younger girl reading it… I certainly at least don't remember the wit and subtleties to Austen's writing that I catch now that I am older! I love your Socks! It took me 2 hours to knit my first inch when I started my first pair of socks! Good luck! Oh they are tiny indeed! But those socks will be very beautiful and special and I just love the colour!! Those stitches are so tiny! I've never used anything smaller than a size 6 needles and that's very small for me. Love the yarn color. Oh my goodness, I have a daughter that would love that color of yarn! 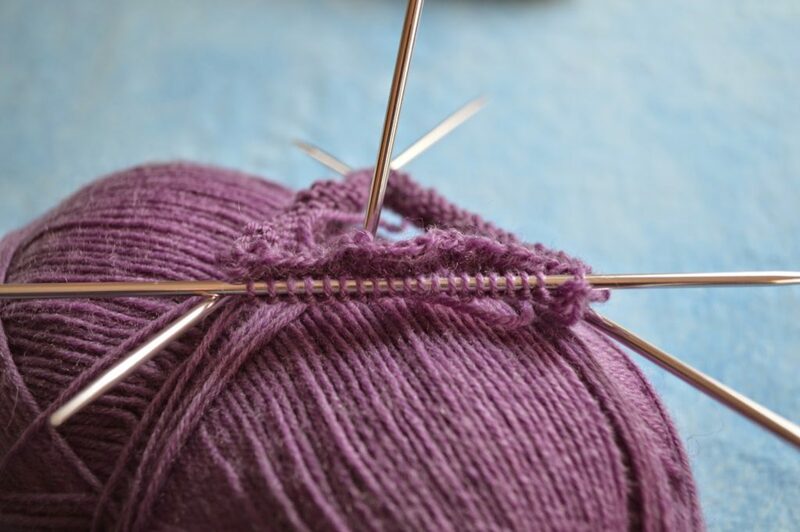 someone once told me that there are the same number of stitches in a pair of socks that there are in a sweater….no don't beat yourself up if they aren't done quickly! I've never knit a sweater quickly either!!! Love the color…. I love that we are both knitting socks Heather. Yes, the stitches are tiny and it takes a lot to make a sock, for some reason I want to say about 22, 000 stitches per sock, but they really are fun to knit. 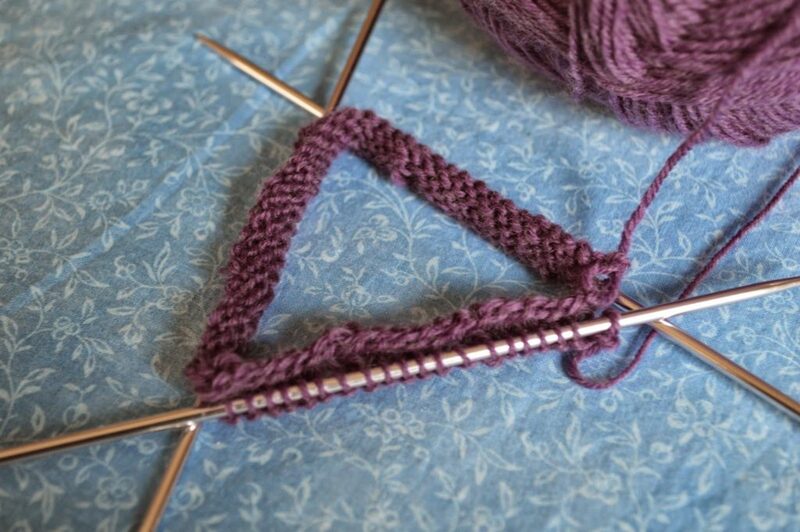 Such a pretty color – and your yarn looks so soft! I find the first rows very slow, but it does improve! 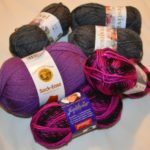 Love the yarn colour – the socks will look wonderful.